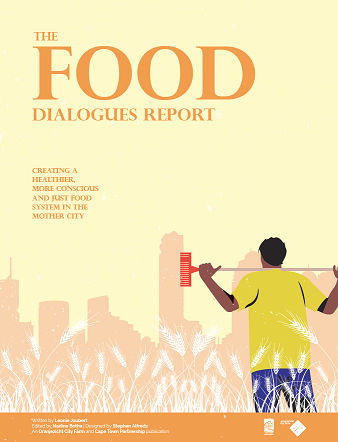 On World Food Day 2014 we took another step towards creating a better food system in Cape Town by launching the Food Dialogues Report in collaboration with the Cape Town Partnership. Packed with local insight and recommendations for action, it is essential reading for anyone who cares about food, nutrition, public health, food security, urban planning, environmental issues and the state of our Mother City. Download the full report [ hi-res | web ]. Following on from the 10-part OZCF Food Dialogues series hosted in Cape Town from May to July 2014. the Food Dialogues Report offers an overview of the state of the food economy in Cape Town – its strengths and weaknesses in terms of culture, urban design, politics, economics, nutrition and environmental impact – and provides a guide to action for private and public entities directly engaged in our food system, and for consumers as well. Written by award-winning South African science writer, Leonie Joubert, author of The Hungry Season: Feeding Southern Africa’s Cities, the Report draw out the narratives, extracts the themes expressed by the various speakers, and unpacks opportunities and ideas that emerged as trends through the discussions. The report was workshopped with the Food Dialogues presenters, through a Cape Town Partnership Green Clusters event, and is published by the Oranjezicht City Farm, with support from the Cape Town Partnership. We encourage you to download a copy, forward this e-mail to your friends and networks, and continue the important dialogue about the future of food and farming in Cape Town at Facebook.com/OZCFarm, and on Twitter using the #ctfoodreport hashtag tagging @OZCFarm and @ctpartnership. Food Dialogues was a 10-part series of talks that brought together some of the freshest minds to discuss aspects of the food system in Cape Town. It was created and produced by the Oranjezicht City Farm as a platform for sharing ideas to foster a healthier, more conscious and just food system in the Mother City. Learn more and access archives, podcasts and videos at www.ozcf.co.za/food-dialogues.